I did not have a visa, but as a Finnish citizen, I knew I could get a Visa on Arrival at the Zimbabwe border. I just didn’t know if I could get the visa at the Beitbridge border while traveling on a bus. If the Greyhound bus wouldn’t wait, I might be left at the border in the middle of the night. The Beitbridge border is located at Limpopo river. I eventually got across the border without any issues. Still, while doing my research, I noticed there was very little information available online about getting through the Beitbridge border crossing from South Africa to Zimbabwe on a bus and getting your visa at the border. Because there weren’t any guide posts available, I decided to write one myself. 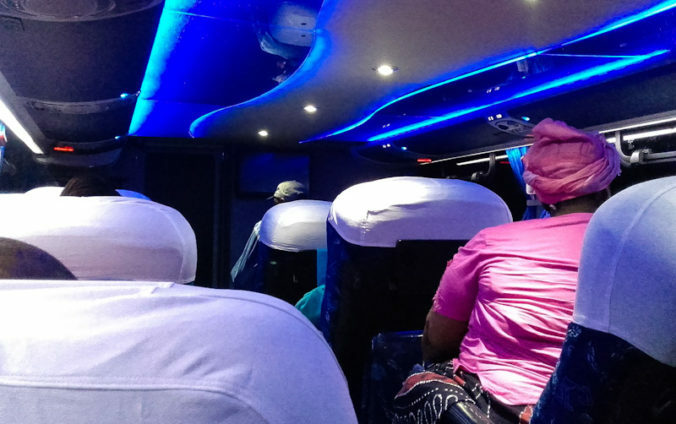 To help other travellers relax more than I did, this post describes how you can get a visa at the Beitbridge border crossing if you travel on a bus. My bus company says I can’t get a visa at the Zimbabwe border. Is this true? Most likely not. If your country is included in the list of nationalities that can get a visa on arrival for Zimbabwe, you can get your visa very quickly at the border. As of February 2018, a single entry visa cost 30 US$ and a double entry visa cost 45 US$ for most countries. The visas for British, Irish and Canadian citizens are more expensive. Why does Greyhound / *insert bus operator here* insist I should get a visa in advance before traveling from South Africa to Zimbabwe? Probably to save time at the border. However, the reality is less strict than the rule on the ticket. My bus driver seemed unbothered when I told him I’d need a visa on arrival, and he also instructed me how to get one. What do I need to get a visa on arrival at Beitbridge border crossing? Your passport + cash in either dollars or rands (I don’t know about other currencies). The border workers should/might have some change, but giving the exact sum makes the whole process faster. You cannot pay with a credit card. I wasn’t asked for a return/onward ticket or yellow fever certification. I also didn’t need to hand any extra passport photos. No visas here. You only get an exit stamp on your visa at the South African side of Beitbridge border crossing. Where do I get my Visa on Arrival while crossing from South Africa to Zimbabwe on a bus? You get your visa on arrival at the Zimbabwe side of Beitbridge border. You first stop at the South African border control, but at this point, you simply follow the queue and get your passport stamped like everybody else. The Zimbabwe border control buildings are another stop on the other side of the Limpopo river. To get a Visa on Arrival at Beitbridge border crossing, you can skip past the immigration queue from the left side and go directly to a counter. Okay. And how do I get a Visa on Arrival if I cross Beitbridge border on a bus? 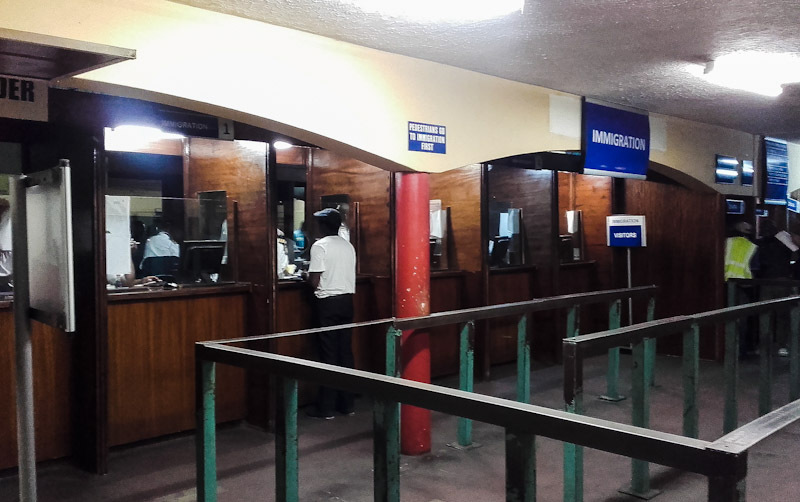 Once you enter the Zimbabwe border control building, skip past the immigration queue (that all other passengers use) and head directly to one of the counters. Tell the workers you need a visa on arrival and you’ll get a visa application form. Fill the form as quickly as you can (have a pen and an address in Zimbabwe ready!) and return to the counter. Hand your passport, pay for the visa and wait for the workers to do the paperwork. In my case, the whole visa process took less than 15 minutes. What do I do after I get my Visa on Arrival? Once you get your visa, head to the next room on the left and take a blue customs declaration form from a table next to a guard. Fill the form and return to your bus (or the other way around). At this point, all our passengers waited outside the bus with their forms. We had to take our luggage out, form a line and open our bags… just to get our customs declarations forms checked and stamped. Despite the extra hassle, there was no luggage check of any kind. We then put our luggage back in the bus and walked fifty meters forward. The bus followed a bit later. We formed a line outside the bus and showed our new passport stamps at the door to get in. 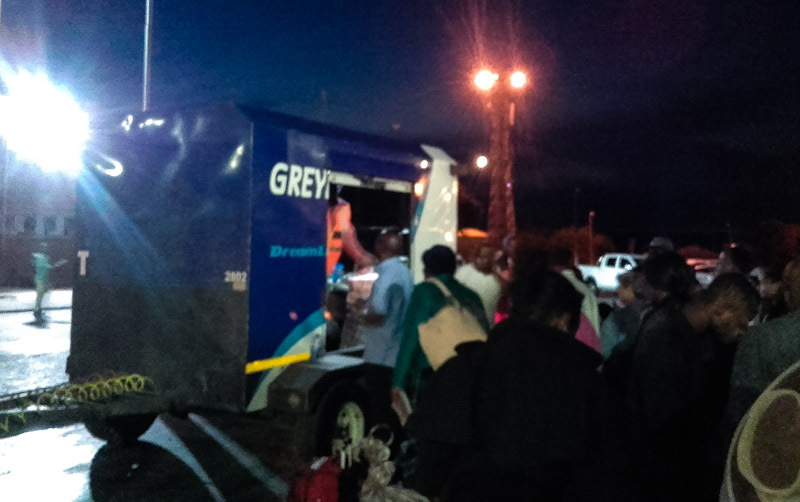 There should be plenty of time to get your Visa on Arrival while crossing to Zimbabwe on Greyhound. Do I have enough time to get my visa at the Beitbridge border if I travel by bus? During my crossing, I was the only person on the bus who needed a visa on arrival. Once I finished my visa process, I was the last passenger at the immigration hall. Slightly worried, I returned to the bus as soon as I could – and ended up waiting for the custom declaration check for around fifteen minutes with everybody else. How long does it take to cross from South Africa to Zimbabwe via Beitbridge on a bus? 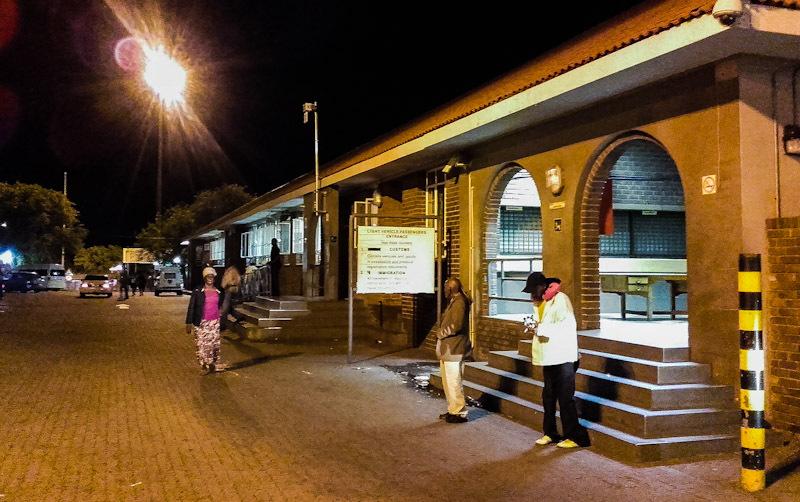 In our case, the whole South Africa – Zimbabwe border crossing took roughly 90 minutes. As far as I know, all the scheduled buses cross the border during the night when there’s less civilian traffic at the Beitbridge border. 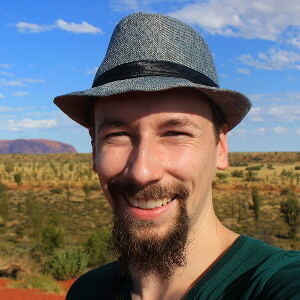 Is there something else I should know before crossing from South Africa to Zimbabwe on a bus and getting my visa at the border? If you take a bus from a town other than Johannesburg or Pretoria, it’s good to know that some South African towns have old and new names. I took my bus from Mokopane, but I could only find the bus on the Greyhound website when I searched by the town’s old name Potgietersrus. Besides towns, the streets might also have different names. My Greyhound ticket gave me a departure point with an old street name that had been changed over 10 years ago! I heard Beitbridge border has a bad reputation. 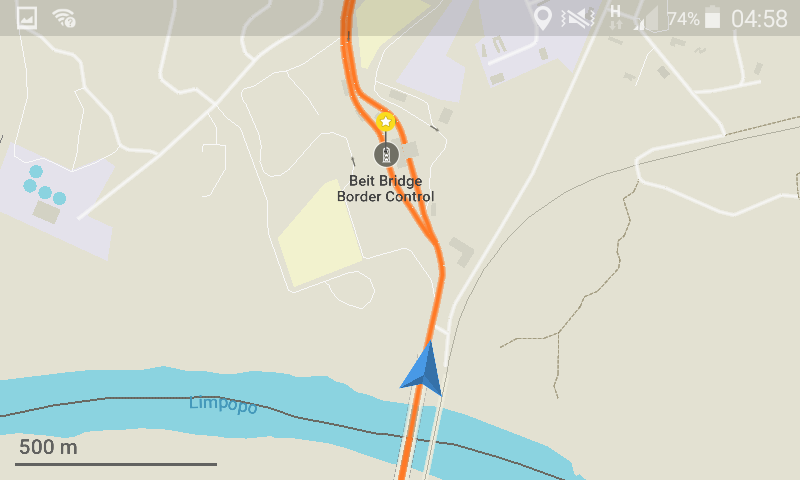 Is the Beitbridge border crossing as bad as they say? Beitbridge border is infamous for long queues, corruption and other issues. For these reasons, many South Africans avoid it completely and prefer to travel to Zimbabwe through Botswana instead. However, I experienced none of this during my crossing from South Africa to Zimbabwe on a bus. The border crossing went very smoothly and I have nothing bad to say about the service I got. Thank you for the tips. You are awesome! Thank you! So are South Africa and Zimbabwe. Thanks! I just booked my greyhound bus ticket and read the same thing. You are my hero. You’re welcome! 🙂 Enjoy your trip and I hope that everything goes smoothly.